There is just something about an octopus. They’re incredibly intelligent. Have you ever watched those videos where they figure out how to navigate a maze or how to get in and out of incredibly tiny places? They are escape artists. And they are compassionate. A family once rescued an octopus which had gotten stranded on a beach. It came back the next day to say thank you to them. 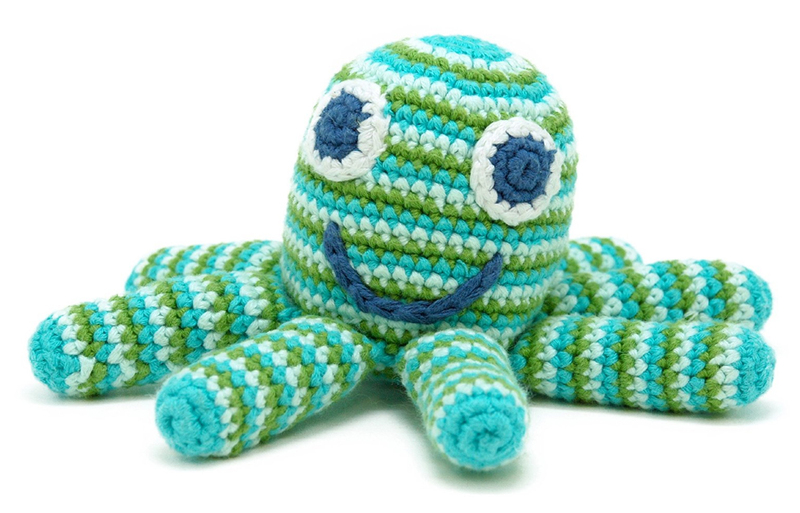 This delightful octopus has a rattle inside it and is perfect for a baby or young child. Heck, it’s perfect for us adults, too! It’s teal and sea green with delicate stripes. It’s hand made with crochet. The artisans who make these octopuses live in Bangladesh and are paid a living wage. It is a fair trade community. It helps the community support itself. Did you know that the plural of octopus is not octopi? That’s because the word octopus comes from Greek, not Latin. And it’s Latin that was fond of all those I endings. Grab a few octopuses for your own home and family!